The reviewer received a copy of the books from the publishers. What are the chances that two excellent children's books of 2012 would focus on ice? That's right: ice. 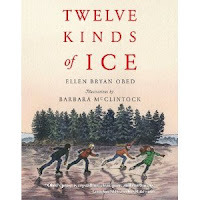 Twelve Kinds of Ice by Ellen Obed and Barbara McClintock is a treasure to be shared with readers of all ages. It's a poetic look at growing up on a Maine farm in winter. Readers who live in cold climates will relate to how Obed eloquently describes ice. McClintock's pen and ink sketches are beautiful. The design and short length of this book make is accessible to the lower range of middle grade readers who haven't developed the stamina to read lengthier nonfiction texts. Visual elements include dozens of photographs, advertisements, pages from catalogs, and illustrations. 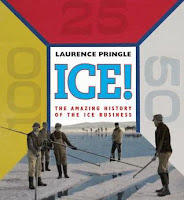 I was intrigued by four pages in the middle of the book that show ice cards from around the country. Ice cards were placed in the windows of homes to indicate the amount of ice families wished to purchase from the ice delivery man. Back matter includes source notes, a bibliography, and a list of web sites, museums, films and books on the topic of harvesting ice. Ice! is an interesting look at how ingenuity made it possible to keep food cold in the 19th century until more advanced technology came along. Hopefully, it will give readers a new appreciation of refrigeration. Twelve Kinds of Ice and Ice! would make an excellent fiction/nonfiction pairing. Visit the Maine Memory Network's online exhibit, Ice: A Maine Commodity to view photographs of ice harvests. Head over to http://asuen.com/blog/ to see all of the nonfiction reviews today. I have the Pringle to read but haven't gotten to it yet. 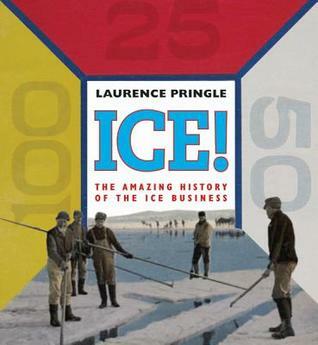 It sounds like a very interesting book and to be honest, I have often wondered about making ice in the 1800s. Have just discovered your blog through the SensibleSavyTeacher - I look forward to reading your posts! I love the idea of learning about non-fiction selections. These two above look great and timely. My students (although in fourth grade) are still fascinated by ice! Nonfiction books are great! Glad you found us, Nancy C.
We are honored, Valerie. Thank you.